My newest little venture into capitalism includes these beauties. 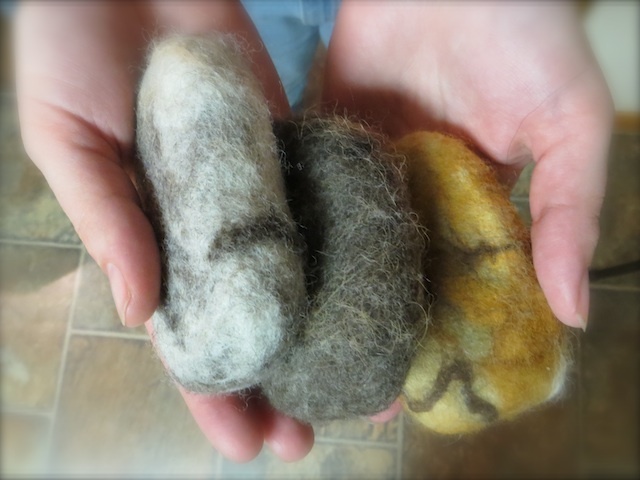 I discovered the process while investigating my wool felting. Remember those Christmas stockings? Well, this includes the wool roving, but instead of using a needle, you simply wet felt the wool around bars of soap. But, you say, there’s a few awfully bright stones in there! Well, after talking it over with a few mothers, while I expounded on the convenience of having washcloth and soap in one, especially for bathing toddlers… They insisted on brighter colors, and so I began a few of those as well! Any color, any soap, any design could be needle felted onto these creations… and… they’re a lot of fun to make! And my hands are quite clean when I’m finished, too! The natural properties of SoapStones’ felted wool gives a gentle exfoliating action… lathering readily, drying simply without the “slime” feel of normal soap, and lending an unexpected delight in your decorating scheme. The felt will continue to shrink along with the soap, until finally you have an empty “pocket”. Then *your* creativity comes into play… slice it open, create a coin purse, a fragrant sachet for a drawer or closet, or a jewelry bag for your favorite pieces. 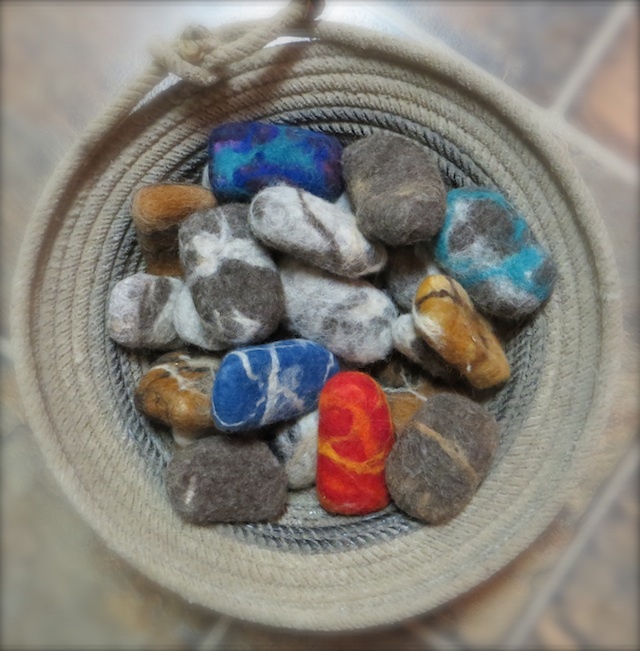 SoapStones will soon be available in select locations.